A goalkeeper described Brazilian football as a "disgrace" after it was claimed he was attacked by fans in the changing room before a top-flight game. Supporters of Flamengo are alleged to have burst into the Macae dressing room as the manager gave his team-talk. "They stole the players' equipment and attacked them and the coaching staff," claimed Macae coach Josue Teixeira. 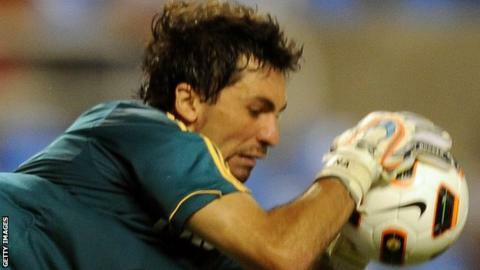 Macae keeper Ricardo Berna played the match with a plaster over a cut on his chin allegedly sustained in the attack. "Brazilian football is a disgrace," the Macae keeper said. "We need severe punishments for this." However, Flamengo president Eduardo Bandeira de Mello said he wanted more details before taking action. "I find it strange that bandits supposedly entered the changing room by the front door and left by the front door without being identified," he told Sportv. Saturday's Rio de Janeiro state championship match went ahead and ended in a 1-1 draw.